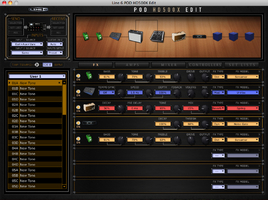 POD HD500X, Guitar Amp Simulation Pedal from Line 6 in the POD Live series. The final exam of the music course I took at the Audiofanzine academy, read as follows: "With a theorem-article of at least 10,000 characters, resolve the equation LINE 6 POD HD500X where X = (new footswitches + powerful DSP)". 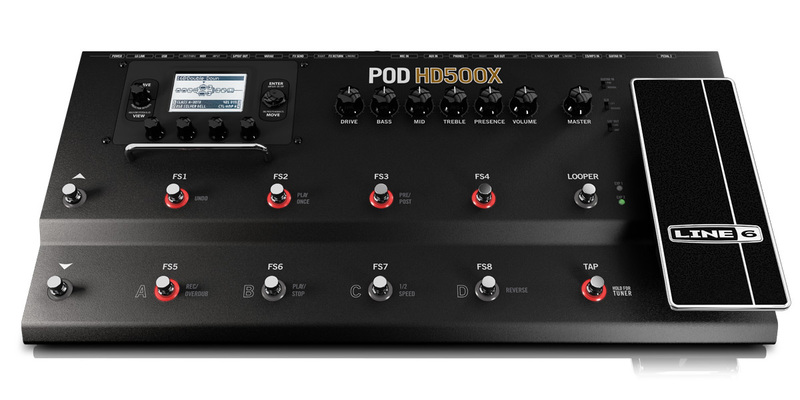 A really demanding challenge...Indeed, three years after the launch of the POD HD 500, Line 6 didn't really make significant changes to its flagship product in order to create a 2.0 version, but rather did some minor retouches to it. Back then my boss made a brilliant, intelligent, subtle, superb, magnificent review. There's little to say about his article, except that it's perfect. So what we'll try to do is dig deeper in the details and complete it (is it possible to complete a Michelangelo or Picasso?) and try to provide another, a much more subjective, point of view on the product while exploring at the same time its new possibilities, which are essentially software related. Right after taking it out of its box the first changes are obvious to the naked eye. The 12 all-chrome footswitches common to the Californian company, which are the same as on the M13 and X3 Live, were replaced by standard switches, backlit by LED rings, whose activation is very smooth, even with socks. If we believe the rumors in users forums, this modification was due to the lack of reliability of the previous switches. That is, unless the goal of the American engineers was to provide guitarists with a better visibility on stage. Whatever the real reason, it's a very welcome physical update — and the only one anyway (besides the "X" added to the name on the casing, of course). 1 aux input, to connect a second guitar and play with a friend. Each will be able to have his own sound. 12 inputs + 8 outputs = 20 connections, the numbers add up! 2 rows of six footswitches. The first switches of each row are meant to change preset banks. 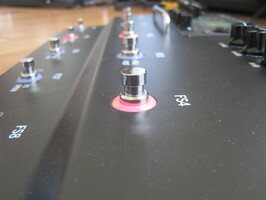 On the bottom row, the next four switches (A,B,C,D) are assigned to the presets (but we can assign them to effects or even effect groups, if need be). The last switch in the row is the TAP TEMPO but also activates the tuner when we press and hold it. 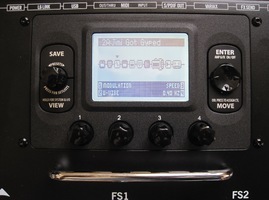 On the top row, four assignable footswitches activate/deactivate the integrated effects on the currently active preset. The last switch in the row activates the LOOPER (48 seconds), making almost all other footswitches change functions in order to record, play back, overdub, erase, etc. the loops. 1 expression pedal with switch to change from one function to the other (EXP1 and EXP2), which is indicated by the LEDs right next to it. Generally speaking, EXP1 will be for volume and EXP2 for effects, but we can assign and adjust the pedal as we see fit. 1 VIEW button underneath the encoder to change the way presets are displayed on the screen. It also works as a sort of EXIT button when we have lost our way in troubled waters. If you press it down and hold it, you gain access to the system settings which might prove very useful (but they are too many to list here, look for the info online following the link below). 4 encoders below the screen (and protected from your evil foot by a metallic bar) to change the parameters of presets, effects, etc. (1+4) encoders + 4 buttons + 1 multi-way navigation disc + 7 pots + (3 x 1) mini-switches = 20 playthings, which are a lot of playthings. To finish this section we must also mention that Line 6 had the delicacy of including three adapters for the power supply (so we can play almost anywhere in the world without the need to buy any accessories), an Allen key (to tighten the expression pedal I guess) and a USB cable. Small details that, despite the brief "quickstart guide", compensate the lack of a real manual, which can be downloaded here. It was not so long ago that the first generations of PODs came with beautiful cardboard manuals packed with humor that taught us about the modeled amps, with pictures and everything, and helped us widen our gear culture. Anyway, you can download an online version here. I will allow myself a brief regression here — at the risk of being off-topic — to go from maths to philosophy by revealing an analogy between amp modelling and soccer games. In the early 1990's, we used to have arcade games with a joystick and two or three buttons (tops) that were terribly fun. Game publishers then started to do some simulation, which made the games more realistic and complex every time, but much less fun as well; there was a moment of hesitation. And then P.E.S arrived revolutionizing video games with a recreational realism that pushed players to master their hand skills. And well, it's the exact same thing with modelling. 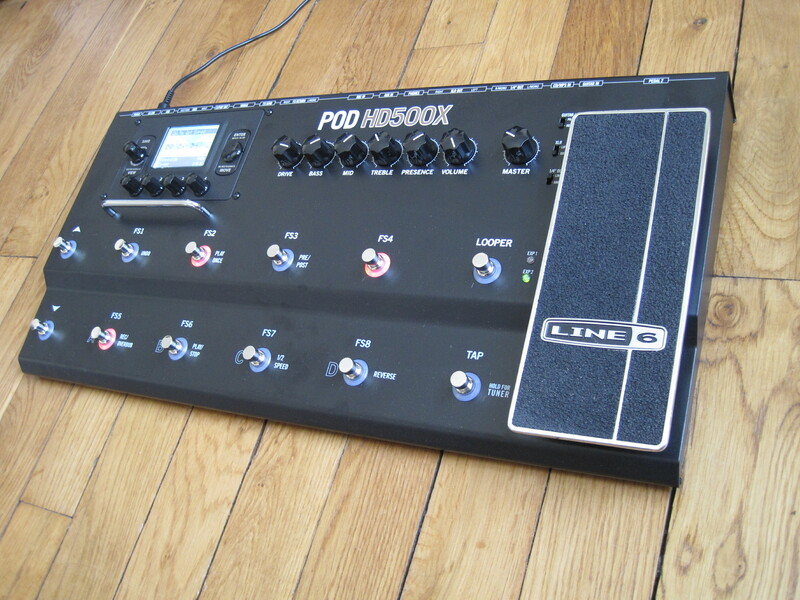 Line 6 introduced the first POD in '98 (when France became World Champion!). It was easily domesticated and had sounds that today would seem more of a caricature or a bad dream, but they could be readily put to use, and it all came wrapped in a small format. 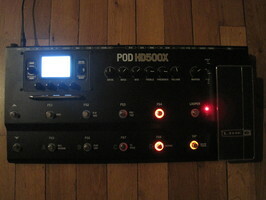 With the POD XT, they started to complicate things a bit by multiplying the sound options (I know what I'm talking about, I have one at home). 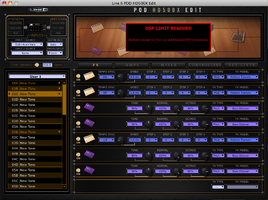 With the POD HD, they increased the simulation level and the possibilities, up to the point where we could pick, among other things, the type of power amp, class A, A/B, etc., or the BIAS settings of the virtual tubes(! ), which made it very difficult to get a natural and credible sound right away. Not to mention the complexity it entailed. 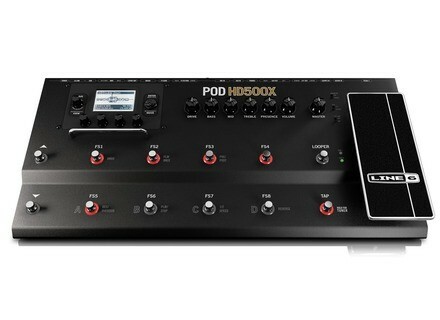 All the more considering that the POD HD was first and foremost conceived for playing live. What can we do if our sound on stage is still too dull in spite of having the MIDs at full blast or if the reverb is too intrusive? Do we really have to go through all encoders and presets to try to change them quickly, in the dark and very stressed out? 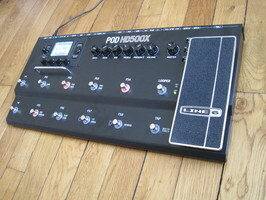 And since we are talking about reverb — which is included in most amps nowadays and in my opinion is indispensable to "wet" the sound —, it is a pity that it's only considered another effect among the rest in the chain, and that it doesn't have a dedicated knob (the famous and mysterious eighth knob), like on previous POD versions. One last thing, and this critique isn't particularly aimed at Line 6, but at all manufacturers of modelling amps/multi-effects. It is about time that they realize that, in general, the average guitar player basically needs a clean sound, a crunch sound, a distortion sound for rhythm guitar and a lead sound (and, while we are at it, it wouldn't hurt to have a switch to boost the solos). So why, instead of giving us direct access to a sound bank that is ready to be used, they always put useless and clichéd "demo" sounds first? In Line 6's defense we can say that the banks are ordered in set lists according to themes, for example: "FX Heavy," very self-explanatory, "Songs / Style" where we can find, among others, different amps in their raw from, or "User 1" with empty presets (finally, I found them!). I must also admit that editing with a computer is pretty straightforward thanks to the preset editor's GUI, which is clear and pleasant (if the window had been a bit bigger, because it can't be made larger — at least on a Mac —, and slightly less somber it would've been perfect). It is great to be able to test with a simple drag and drop how the different positions of an effect in the chain affect our sound. Mad scientists will try all sorts of combinations and some of their crazy experiments might end up with unexpected, but positive, results (it's also important to remark that the widespread rumor on the web regarding new routing possibilities is false), especially as with the new processor — which is supposed to be twice as powerful (according to information taken directly from Line 6) — I was only able to get a couple of "DSP limit reached" messages when really pushing it. 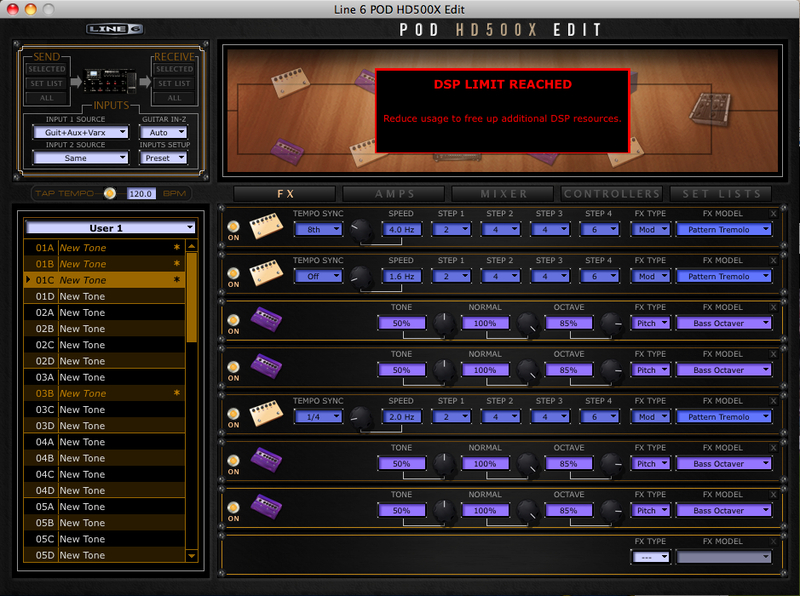 We can chain as many amps and effects in whatever order without the message ever popping up. It all depends on the nature of the effect, but it really needs to be abused with two amps and eight modulation or pitch effects, or three reverbs, to get the warning. 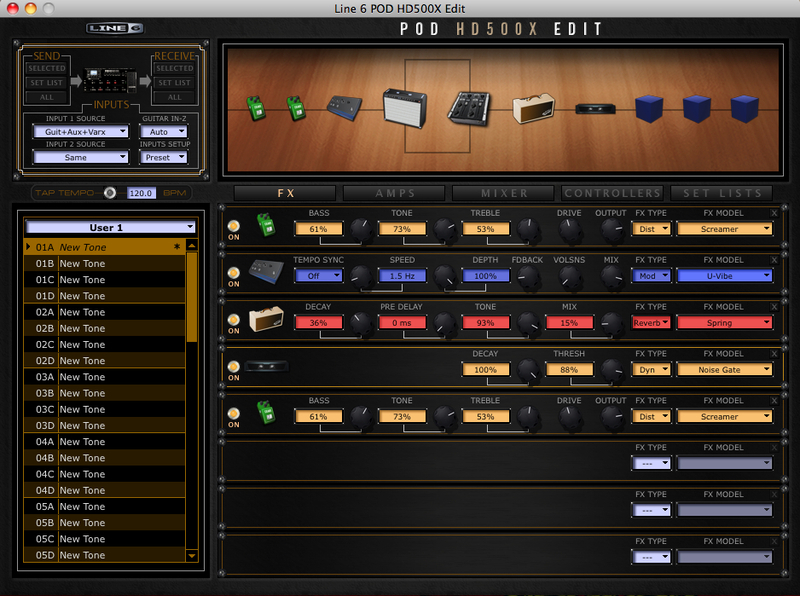 I nevertheless concur with Red Led that a resource-level indicator would've been very welcome, but I guess it would've also eaten some more resources as well... After all, if Line 6 decided to go for more effects it''s not too bad. Finally, to respond a technical question that is very frequently asked in the forums: it is still not possible to send the WET and DRY sounds in parallel via USB for reamping. Same ol', same ol'. In order not to write down the 16 amp heads and combos originally modelled for the POD, I recorded a musical example for every amp (+ associated cab and mic) with their name. I used almost only the basic sound of all models, complementing them with a bit of reverb. In every example I indicate which guitar (Fender Telecaster Deluxe, Fender Stratocaster 69, Gibson Les Paul Custom, Gibson SG, Gretsch 6120 Brian Setzer Signature) was used. All in all, the modellings are alright, even if certain amps, particularly those dedicated to distortion sounds, make our chords lose some definition (the lower notes tend to mask the higher ones). The Fenders, the nice Hiwatt crunch, the most unusual amps like the Divided by 13 or Dr Z, and the nasty distortion of the very hollow Engl come out pretty good. Certain models like the JTM-45 will be clean enough for live, but some others seem a bit exaggerated, like the dull Mesa Boogie that will fit better an arrangement in a studio mix. Line 6 effects are often very good and those of the POD are no exception to the rule. Those who own one and wish to upgrade their gear in the future or go back to tubes and to a more natural sound will still be able to use it as a very good multi-effects. Oh, the joys of marketing! An ‘X’ at the end of the name isn't enough to make something new out of something old, and in the end, besides the footswitches and the DSP, there is nothing new under the sun here. Even the introductory price (around $500) is almost identical, while the price of the previous version has obviously gone down. It's sort of a forced update of the POD HD 500, which a little birdie told me it is meant to replace for good. Owners of the original one have nothing to regret. As for the rest of you, this POD is a true Swiss knife for guitar players both live and in the studio and with a reasonable price, which ought to be more than enough to draw your attention.